Mexico is sending more than 3,000 soldiers and police to the northern border city of Tijuana to help fight drug trafficking and gang violence. The troops will hunt suspected traffickers, patrol the coast and man checkpoints, a senior official said. The city, across the border from San Diego in California, is a major entry point for drugs into the US. It has been hit by violence between rival drug gangs, with more than 300 killings in 2006. The new president, Felipe Calderon, who was sworn in last month, has vowed to curb drug-related violence. Interior Minister Francisco Ramirez Acuna said the Tijuana force would be backed by 28 boats, 21 planes and nine helicopters. "We will carry out all the necessary actions to retake every region of national territory," he said. "We will not allow any state to be a hostage of drug traffickers or organised crime." Hundreds of police arrived in the city on Tuesday, the Associated Press news agency reported, and more are expected in the coming days. Last month Mr Calderon sent 7,000 troops to Michoacan state on the Pacific coast to curb the drug violence. More than 500 people died in violence there in 2006. In the worst incident, masked men burst into a bar in Uruapan and flung five human heads onto a crowded dance floor in an apparent warning to a rival drug gang. 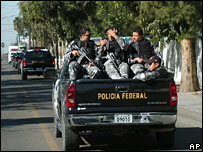 Since the deployment in Michoacan the troops have arrested more than 50 people, some suspected members of rival gangs. In a New Year's message, Mr Calderon pledged to intensify the fight against crime and drug trafficking. "The operations will allow us to re-establish the minimal security conditions in different points of Mexico so we can recover little by little our streets, our parks and our schools," he said.